Google Maps no longer shows suggestions only from your recent searches. When you start typing a query, Google Maps shows popular locations, searches and local businesses. For example, you can type "red" and the first suggestion is "Redmond, WA, USA". 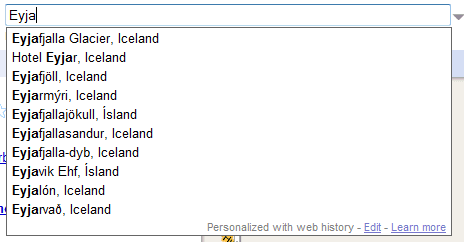 The suggestions are helpful if you want to type a complicated name like Eyjafjallajökull and you only remember the first letters, but Google doesn't do a great job at ranking the list of suggestions. It works very well for long addresses as you can select it from the list before typing it all out. But when searching for a route number, its hit or miss. For example, in FL, 'Route 9A' doesn't show up, but 'R 9A' works as well as 'Florida 9A', but typing as the latter two is probably atypical. I think most people would search for 'route 9a'. Another new(?) map feature I just noticed. The map now continues to scroll slowly for a couple of seconds after you drag the map and your mouse was still in motion after you release the mouse button. 'Aerial panning', which is under the "EARTH' Option, perhaps the terrain feature can be returned as a feature again. It's still there. Check the "more" dropdown. I do not want this annoying "feature"
It is distracting to have all these suggestions pop up. I want to be able to disable this. Turning it off in google preferences only disables it for web search, not maps.